As we are striding into Autumn there is a marked change in our eating habits and the lovely seasonal fruit and veg. I bought some fresh figs yesterday, which like most fruits can be bought all year round but are now at their best and reasonably priced. Figs are rich in soluble fibre and minerals including potassium, calcium, magnesium, iron and copper and are a good source of antioxidant vitamins A, E and K that contribute to health and wellness. A 100g serving contains approximately 43 kcals, 1.3g protein, 9.5g carbohydrate and 2g fibre. Figs are often recommended to nourish and tone the intestines and act as a natural laxative because of their high fibre content. Many of us consume too much sodium (salt), found in processed foods. High intakes of sodium can lead to deficiencies of potassium and this imbalance between the two minerals can lead to hypertension (high blood pressure). A diet rich in fruit and vegetables – including fresh figs, naturally increases potassium and is therefore encouraged to help lower blood pressure. 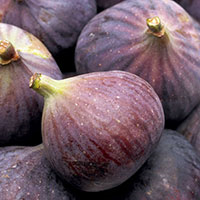 Figs also contain prebiotics which help support the pre-existing good bacteria in the gut, improving digestive wellness. I love to have them chopped and mixed with organic natural yogurt and cinnamon and a few crushed almonds or with porridge. This salad is great with Parma ham or prosciutto or for a vegetarian version mozzarella or feta. Cut each fig lengthways into 4 wedges, make marinade by whisking together vinegar, lemon juice, oil and salt and pepper. Stand the fig wedges up in the middle of a shallow dish, scatter the lemon zest and thyme on top then drizzle with the marinade. Stand a room temp for at least 30 mins. Tear the mint, slice the mozzarella, toss with the mint then season. To serve arrange the mozzarella and mint mixture around the figs, scatter with rocket and drizzle with olive oil.